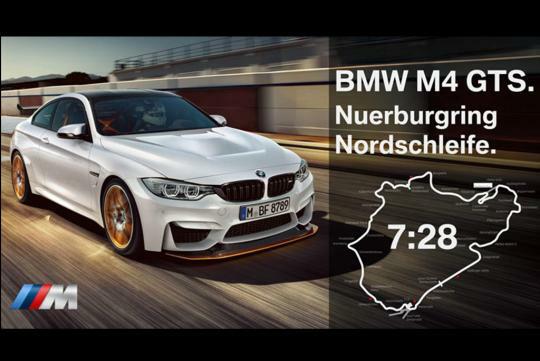 The German car manufacturer has just published a video showing their BMW M4 GTS clocking a impressive 7:27.88 laptime on the notorious Green Hell. To put it into perspective, the timing it recorded is as fast as Ferrari's 458 Italia and McLaren's MP4-12C. It is also a stunning 20 plus seconds faster than its "normal" variant, the M4. The huge difference in timing between the two variants is down to the optimised suspension settings, the increase in power and the removable of unnecessary weight. FYI, the GTS variant puts out a good 493bhp plus 600Nm of torque and comes with the world's first water injection system that cools down the intake temperature, allowing for a higher boost pressure.